Between growing up on a dairy farm and working as a Federal crop inspector for the U. S. Department of Agriculture, Jim Bucher wedged in 17 years of playing professional baseball from 1930 to 1946. Bucher was an infielder and occasional outfielder who batted left-handed and threw right-handed, and spent his better years in the Brooklyn Dodgers system. With a middle name unique in the annals of major-league baseball, James Quinter Bucher was born in Manassas, Virginia (site of the battle of Bull Run during the Civil War) on March 24, 1911. His parents George Pfautz Bucher and Laura Alice (Kane) Bucher, ran a dairy farm there and, at the time of the 1920 census, had six children: Ruth, George T., Wilbur, James, Lenna, and Lester. The family was of Dutch-Irish background.1 James (Jim) went to the Manassas schools for his first eight grades but then the family moved to Palmyra, Pennsylvania and he graduated from high school there. He played ball in high school, and then semipro ball in Palymra. Bucher's first year in baseball was with the Wayneboro (Pennsylvania) Red Birds in the Class-D Blue Ridge league; in 1930, he played second base in 110 games and hit for a .282 batting average. He did commit a rather high 43 errors for a .933 fielding percentage. That got a little worse in Class-C ball in 1931; he committed 49 errors for a .920 fielding percentage. His 1931 season was spent with the Middle Atlantic League Scottdale (Pennsylvania) Cardinals. He played 120 games and upped his batting average to .323 which, not surprisingly, earned him another rung up the ladder. As the "Red Birds" and "Cardinals" team names suggest, Bucher was in the St. Louis Cardinals farm system. In 1932, he played for Elmira in the Class-B New York-Pennsylvania League. There he hit .307 in 127 games. Elmira finished in last place. After the season, Bucher married Ruth Edmeé Walker on October 22, 1933. She had been a student at the University of North Carolina. He ran a filling station during the offseasons. Bucher's debut was in a pinch-hitting role on April 18, 1934. He failed to get a hit in any of his first eight plate appearances. His first hit, a single, came in the May 2 game against the Giants. His first RBI was on May 13. His first home run didn't come until 1935. On May 30, Bucher suffered a broken ankle in a game against the Giants and was put on the voluntarily retried list. He was out until August 4. He didn't collect his second RBI until September 1. The 1934 Dodgers, under manager Casey Stengel, finished sixth. By season's end, Bucher had 84 at-bats, and a .226 batting average, eight RBIs, and 12 runs scored. Everything came together for Bucher in 1935 and he had the best season of his career. He was still working as a utility infielder, but he was called on in 123 games and he batted .302, third-highest on the ballclub. His 58 RBIs ranked him fourth. Both stood as career bests. He hit seven home runs. Utility he was, working 41 games at second base, 39 games at third base, and 38 in the outfield. He pinch-hit a few times, too. Probably his most thrilling moment was the game against the Cardinals on June 26. The Cards had scored three runs in the top of the ninth to tie it, then took a one-run lead in the top of the 10th. Bucher hit a three-run homer in the bottom of the 10th to win it. The following year – 1937 – he played in his most games (125), batted almost the same (.253 with 37 RBIs and four homers.) In 1937, he was the victim in an incident where an apparently inebriated pitcher Van Lingle Mungo broke into Bucher's hotel room and woke him and his roommate (Woody English) up, and beat on both of them – though it was Mungo who ended up the worst off physically—and then in the pocketbook when Mungo was assessed the largest fine to date in National League history, $1,000.7 His best game of the year was another that earned him a subhead; he collected five hits in the 15-7 win over the Giants on September 3, among them two triples and a grand slam. After the season, the Dodgers really, really wanted shortstop Leo Durocher so on October 4, they traded Jim Bucher, Johnny Cooney, Roy Henshaw, and Joe Stripp to the Cardinals to get him. 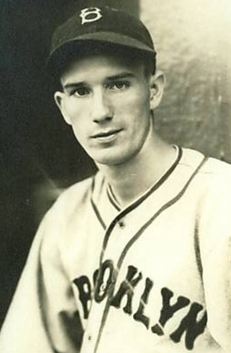 Bucher began the 1938 season with St. Louis and played in 17 games, through May 11. He was batting .228 with seven runs batted in. In his last game, he was 1-for-3 with two RBIs. Two days later, though, he was unconditionally released to Columbus, their Double-A farm club. He didn't come back to the big leagues until 1944. For the 1938 Columbus Red Birds, playing under Burt Shotton, Bucher played in 121 games and hit for a .317 batting average. He had two more good years with Columbus in 1939 (116 games, .288) and 1940 (127 games, .285). After seventh-place finishes in 1938 and 1939, the Red Bird finished second in 1940, and in 1941 – still under Shotton – they finished first in the standing and won the playoffs. Bucher was a second-team All-Star in the American Association in 1941, but he only appeared in 52 games (.259). The Toledo Mud Hens team was in the St. Louis Browns system. Bucher played in 62 games, drove in 39 runs, and hit .339. He played for Toledo in 1943 and 1944 as well – 144 games, .281 with 63 RBIs in 1943. He started 1944 with the Mud Hens and was hitting .244. The Boston Red Sox called. They were losing players left and right to military service and had just learned that Bobby Doerr was classified 1-A. Infielders Jim Tabor and Eddie Lake were both fighting injuries. On May 29, the Red Sox bought rights to the infielder who was described in the Boston Globe story as "the one-time sparring partner of pitcher Van Lingle Mungo. "9 He'd been recommended to the Red Sox by Louisville Colonels manager Bill Burwell. Primarily, Bucher played third base from the May 30 doubleheader on, though at the end of August when Doerr left for the Army, he switched over to play second base. The Red Sox were in a pennant race up to that point, but with Doerr and others gone they rapidly dropped out of the running. He hit .274, with 31 runs batted in and four home runs. His biggest games were June 3 when he hit a grand slam, and drove in six runs against the Tigers in an 11-1 win and on August 30 at Yankee Stadium, when he drove in four runs, in a game Boston lost, 9-7. In 1945, even against depleted pitching around the league, Bucher struggled at the plate. After the first game of the August 3 doubleheader, he was batting an even .200. The Sox brought up the untested Ty LaForest to take over for him at third base. In 151 at-bats by season's end, he hit .225 with only 11 RBIs. For someone whose fielding was suspect with Toledo, it is worth noting that over 589 chances in his 204 major-league games, his fielding percentage was .939. His career major-league batting average was .265. The December 9, 1945 Oregonian announced that the Portland Beavers had purchased Bucher from the Red Sox for cash. His last year in ball was 1946 with Portland; he might have played more but he was badly spiked in the June 2 game and had to be taken from the field in an ambulance. A bone in his ankle was fractured and he missed a considerable period of time. He was back by early August. Bucher played in 72 Pacific Coast League games and hit .242, with only 10 RBIs. From 1947 through 1950, Bucher managed the College Hill Chix baseball team of Fredericksburg. He was later named to the Central Pennsylvania Chapter Sports Hall of Fame. Predeceased by his wife Ruth, Bucher died in Elizabethtown, Pennsylvania on October 21, 2004 at the age of 93. He is buried in Palmyra. In addition to the sources noted in this biography, the author also accessed Bucher's player file and player questionnaire from the National Baseball Hall of Fame, the Encyclopedia of Minor League Baseball, Retrosheet.org, Baseball-Reference.com, Rod Nelson of SABR's Scouts Committee, and the SABR Minor Leagues Database, accessed online at Baseball-Reference.com. 1 The Dutch-Irish decent was self-reported by Bucher in a player questionnaire he completed for the National Baseball Hall of Fame in 1960. He was still living in Palmyra at the time. 2 Baseball America, December 20, 2004-January 9, 2005: 72. 3 "3 New Players To Dodgers in Draft Drawing," Brooklyn Daily Eagle, October 3, 1933: 28. 4 Harold Parrott, "Bob Quinn Showing Hand in Rebuilding of Dodger Team for 1934," Brooklyn Daily Eagle, October 12, 1933: 24. 5 Harold Parrott, "Dodgers 'Kidnaped' Jimmy Bucher As Cards Were 'Covering' Him Up," Brooklyn Daily Eagle, January 2, 1934: 18. 6 Roscoe McGowen, "Dodgers Get Two Runs in Eighth To Turn Back Cardinals, 4 to 3," New York Times, June 5, 1936: 25. 7 Associated Press, "Row Costs Mungo One Grand," San Francisco Chronicle, May 23, 1937: 98. 8 Associated Press, "Houston Buys New Infielder; Sells Houston," Dallas Morning News, July 3, 1942: 9. 9 Dan Kane, "Red So Acquire Bucher of Toledo," Boston Globe, May 30, 1944: 15. 10 Associated Press, "Two Nats on Train Derailed in Montana," Washington (D.C.) Evening Star, October 10, 1945: 4. 11 L. H. Gregory, "Greg's Gossip," The Oregonian, February 13, 1946: 23. 12 Dodger Alumni Association Update (player questionnaire) found in Bucher's National Baseball Hall of Fame player file, and James Q. Bucker obituary, Lebanon (Pennsylvania) Daily News, October 23, 2004.